Next week the international defence establishment will gather in Paris for Eurosatory, the biennial arms extravaganza. One subject that is likely to be high on the agenda is NATO’s options for dealing with a newly-belligerent Russia, which since the last exhibition has annexed the Crimea region and helped spread instability in eastern Ukraine and Syria. In line with this new interventionist strategy is Moscow’s development of so-called hybrid warfare, which blends its traditional reliance on armoured forces with new cyber capabilities. 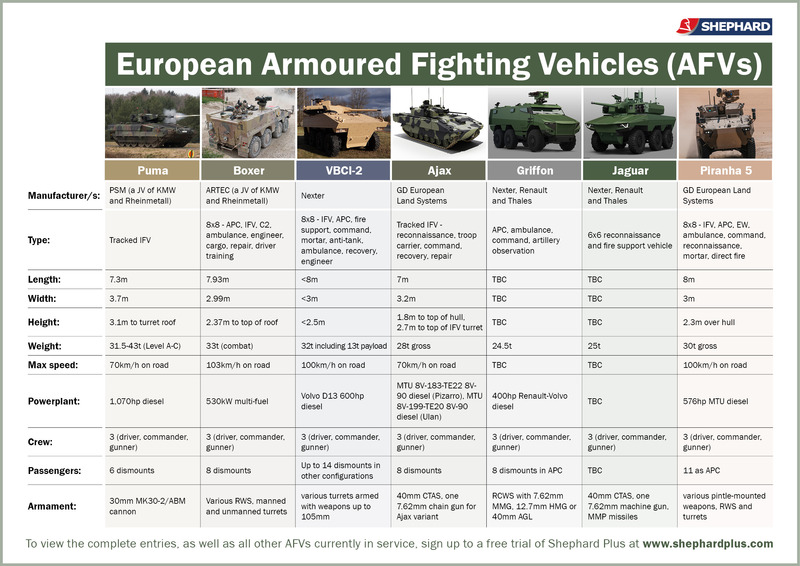 Shephard’s land forces editor Tim Fish considers these developments as part of our Eurosatory coverage, which you can follow on our show microsite. In addition, we have produced a comprehensive report on Russia’s new military capabilities and what this may mean for European defence chiefs. With NATO holding its summit in Warsaw in July, the Russian question, member states defence spending commitments and the future of NATO bases in central Europe will be high on the agenda. Such issues will also cast a long shadow over Eurosatory. View our Russian military capabilities report here. Who has the best armoured fighting vehicle? One of the best features in the latest issue of Land Warfare International looks at the new generation of armoured fighting vehicles that are entering the inventories of Europe’s armies. With a raft of new types and models entering service or under construction, we thought it would be interesting to put up a comparison the base models. Although a vehicle’s capability will be defined by the types of systems that are fitted, it is still interesting to view the main hull and machinery characteristics of these new products. So to help with this, we got our design team to throw together this handy reference chart (click to enlarge), outlining the basic statistics for each of the latest tracked and wheeled designs that are available. The German Army is currently converting from the 45-year old Marder IFV to the new Puma IFV, which the manufacturer describes as the ‘most powerful IFV worldwide’. In German service, the Puma will work alongside the 8×8 Boxer multi-role armoured vehicle, which is claimed to have the highest protection level of any vehicle in its class. The company-funded VBCI-2 was only just unveiled by Nexter in September 2015 and that vehicle features a new all-welded aluminium hull design with a higher roof line to provide greater internal volume. The UK’s renewal of its armoured vehicle fleet centres on the GDLS-UK Ajax tracked reconnaissance vehicle, the only new armoured vehicle in development or production for the British Army. France, meanwhile, is developing the 6×6 Griffon Véhicule Blindé Multi-Rôles (VBMR) multirole armoured vehicle and the 6×6 Jaguar EBRC armoured reconnaissance and combat vehicle. The General Dynamics LAV design also continues to prove popular and the latest iteration, the Piranha 5, has been chosen to replace the Danish Army’s tracked M113. What do you think of the latest industrial offerings from Europe? Have European armies made the right choices for armour? Are there any others that should be included here? Be sure to leave your comments below. Meanwhile, all the latest news about these vehicles and their subsystems will emerge next week at Eurosatory in Paris so be sure to keep tabs on our show news. When news first broke of a helicopter crash near the Norwegian city of Bergen on 29 April, it almost seemed an added cruel twist when it was confirmed the aircraft involved was an EC225. While first and foremost a tragedy for the families of the 13 passengers and crew that lost their lives, the accident will have come as a massive blow to manufacturer Airbus Helicopters, given the recent history surrounding the Super Puma family. You can read our account of the accident here but from initial accounts it seems the aircraft’s main rotor had become detached in the moments before the accident – the video that appears to show the detached rotor in flight makes chilling viewing. Following a spate of incidents with the Super Puma family in the North Sea in the past seven or eight years, it was inevitable that there would be a public outcry following this latest accident. A petition appealing to the UK’s Civil Aviation Authority to ‘remove the Super Puma from service’ has gathered 25,000 signatures at the time of writing, mirroring a similar Facebook page created after the 2013 Sumburgh crash. For oil and gas workers who have to travel to work by helicopter on a regular basis, and who feel they have no choice but to fly on the Super Puma – whether it is the H225 or AS332 – or lose their jobs, any widespread perception the type is fundamentally unsafe clearly makes for a difficult working environment. Nevertheless, the community needs to take stock before damning the Super Puma and Airbus Helicopters altogether. While a design fault with the main gear box was the cause of two ditchings in 2012, this has now been rectified, and the previous crash causing fatalities – the 2013 crash at Sumburgh – was attributed to the pilots not following standard operating procedures. This latest incident may be more closely related to the 2009 crash of a Bond AS332L2 Super Puma, which killed all 16 people aboard and the investigation found was caused by main rotor separation following a catastrophic gearbox failure. Aligned to the lack of a common cause linking all the accidents since 2009, it should be remembered the Super Puma family has accumulated more than 5 million flight hours to date, the family racking up 240,000 flight hours in 2014 alone. When news emerged of the crash in Norway, I was preparing a feature on the H225 Safety Partnership and maturity programme, which will examine efforts to improve safety, ease the maintenance burden and improve availability. While this latest tragedy will undoubtedly cast a long shadow, there is no denying the safety improvements that have taken place to date and the willingness of everyone across industry to get this right. We’ve ranted before about the blatant lack of specialist knowledge and the invariable mistakes that follow when the mainstream media tries its hands at covering defence issues. Most recently it was our MD Darren Lake getting annoyed at the BBC describing the British Army’s new Ajax reconnaissance vehicle as a tank. On Sunday it was my turn to feel my blood boiling with the apparent news that the SAS had been given a ‘Transformer heli-plane’ to aid its response to any terrorist attack on UK soil. So far, so wrong. Aside from the fact the V-22 is classed as a tiltrotor, in the six years I’ve been interviewing pilots, air crew, programme managers and Bell-Boeing salesmen about the Osprey, I’ve never heard anyone refer to it as the ‘Transformer’. The Mail on Sunday’s vision of the ‘Transformer heli-plane’ in action with UK special forces. The article went on to say the Osprey has machine guns installed in the nose and on the rear ramp, and that its ability to perform as a helicopter and as a fixed-wing aircraft is due to ‘the three 19ft-long rotors attached to each wing’. The integrated nose cannon was dropped as a requirement back in 2002, so perhaps they were confused about presence of the CV-22’s in-flight refuelling probe. We can safely presume this was not a misconstrued reference to the BAE Systems Remote Guardian belly-mounted gun. And while this is being a little pedantic, the aircraft obviously has only one rotor on each wing but three rotor blades. Bell-Boeing has been pushing the V-22 at the UK for some years so all mistakes aside, perhaps the Mail on Sunday actually had a significant defence procurement scoop here? Or perhaps not, with the qualifier late in the story that ‘it was unclear last night whether the SAS’s Ospreys have been purchased, or leased from the US Air Force’. So what we are probably talking about here is SAS troops training with a US Air Force CV-22, likely one based out of RAF Mildenhall where a number have been stationed since 2013, and which we understand has been happening for some time. Even more depressing for someone who holds out hope for the future of journalism, and therefore humanity, was the fact the story was picked up by the Times (paywalled link) the following day, lifting all the facts from the Mail’s story and running a 200 word version, which still managed to squeeze in all the main mistakes. This is The Times of London, which I pay a monthly subscription for in order to access such ‘premium content’, making me wonder exactly what I am paying for – if they are this sloppy in an area I know a little about, how well am I being served by the coverage of sectors where I don’t have as much background knowledge? Although, perhaps I am being unfair – as pointed out on Twitter, if the term ‘heli-plane’ is good enough for Lego, it should be good enough for the rest of us as well. As the Pentagon was revealing its vision for its next-generation scout helicopter, providing details to industry on the lightest member of the Future Vertical Lift (FVL) family, I found myself instead excited by the UH-60A. At the end of February, the US Army released an RfI for what it is now calling FVL Capability Set 1 (CS1), which will be developed for the reconnaissance, light attack and light assault roles. Usually details of the Pentagon’s latest attempt to introduce a new scout helicopter would be excuse enough for me to wax lyrical about the ghosts of Comanche, ARH and the more-recently aborted AAS programmes and the pitfalls likely awaiting this latest iteration. However, instead I found myself wandering around the civil helicopter extravaganza that is Heli-Expo, this year in Louisville, Kentucky, where the presence of three civil-configured UH-60A Black Hawks added some additional spice to proceedings. The US Army is in the middle of an active divestiture programme and 110 UH-60As had already been sold to date. These are being snapped up by companies keen to offer a lower-cost alternative to the UH-60M or S-70i as FMS items to allies, as well as to civil customers for such missions as fire-fighting, construction and utility. One of those companies is BHI², which displayed its ‘H-60X’ research and development aircraft (below) at Heli-Expo. BHI² director of experimental flight test, Alex Anduze, told me the company had purchased more than 40 UH-60As from the US Army in the past year. He noted that some 110 UH-60As had already been sold by the army to date and BHI² – a partnership between Brown Helicopter and Brainerd Helicopter – was looking to position itself as a primary supplier with its ‘C’ Hawk. The company was also looking to promote how it can help sub-contractors develop and certify equipment independently of the main OEMs. Arista Aviation, which currently has five Black Hawks on its books, displayed an UH-60A with refurbished glass cockpit. The CEO of the company, Richard Enderle, has personally been flying the Black Hawk since 1982 and told Shephard reporter Grant Turnbull that he expected the market to ‘explode’ with demand for the aircraft, given their pedigree. Also pitching for business were Timberline Helicopters, which claims it has access to more than 30 aircraft through a strategic partnership with Unical Defense, and PJ Helicopters with its ‘Utility Hawk’. While the introduction of the UH-60A has the potential to really shake up the civil utility market, given the budgetary pressures facing most major militaries, let alone smaller services in developing economies, the offer of a renovated Black Hawk through the FMS mechanism is likely to prove attractive. Given the US government is auctioning ex-army UH-60As for $200,000 (alongside forklifts, sailing boats and ‘gold items’ on the GSA Auctions website), the refurbished aircraft are likely to be extremely competitive. Operating expensive assets such as helicopters in an age of austerity was the theme of my comment last issue. When simpler airframes such as the MD 530F/G are outselling the more complex Boeing AH-6i (see p19), and countries such as Kenya and Lebanon opt for zero-timed Bell UH-1H-based Huey IIs there is a clearly growing market for robust, lower-cost machines. The UH-60 is obviously a battle-proven aircraft, with more than eight million hours of operation with the US Army and other fleets, and would be the top of many countries’ shopping lists if the price is right. At a gathering of the best and brightest of any industry, you would expect conversation to gravitate towards the expected benefits next-generation technology is likely to bring. Curiously, this was not really the case during the International Military Helicopter conference held in London in mid January, where it seemed delegates were more interested in learning about mid-life upgrades of in-service aircraft than the co-axial/tiltrotor designs that may enter service in the 2030s. In many ways, this is not surprising. One thread of the conference was doing business during the age of austerity, particularly since many of the emerging economies that were touted as customers of the future have been knocked back by the low oil price. The other theme was the dynamically evolving nature of today’s threats. Instability in Afghanistan, the Central African Republic, the Democratic Republic of Congo, Iraq, Libya, Somalia, South Sudan, Syria, Ukraine and Yemen has cast a long shadow over the international community’s ability to act to resolve such conflicts. Against such a backdrop, conversations did not stray far from the question of how to keep current forces relevant in the face of budgetary pressures. Among the countries trying to do more with less was Canada, which itself has had issues getting a relatively new platform into service in the form of the CH-148 Cyclone and is now looking to extend the life of its CH-146 Griffon and CH-149 Cormorant. Meanwhile, France is working on an enhancement to its Tiger attack helicopter it describes as the Tiger Mk 2, which adds laser-guided rockets and improvements to the avionics and night vision capabilities. In the longer term, the country is looking to get consensus from the other Tiger partners – Australia, Germany and Spain – on defining a more comprehensive mid-life update it has dubbed Tiger Mk 3. Any upgrade of this nature rests on the four countries settling on a common missile for the Tiger rather than the current situation which sees Australia and France employ the Hellfire, Germany the PARS 3 LR and Spain the Spike-ER. Set for the 2023 time frame, the global upgrade of the Tiger Mk 3 will include improvements to ‘the entire digital space’, providing further enhancements to the avionics and communications suite. One industry presentation at the conference that laid out a convincing argument for how legacy platforms can be given a new lease of life came from BLR Aerospace. Dave Marone, VP of sales and marketing, outlined the disproportionate cost to smaller nations – in fact to most nations apart from the US – of buying a new attack helicopter fleet. With some 320 AH-1 Cobra attack helicopters still in service around the world, BLR has devised a comprehensive upgrade it has dubbed the AAH-1, which reduces the weight of the aircraft, increases engine power and adds BLR’s FastFin modification. The latter brings a 15% increase in tail rotor authority, allowing 1,500lb/680kg more OGE hover in winds up to 30kt. The company is also offering a range of performance improvements, navigation/communication upgrades and weapons and fire management systems based on customer needs. We will feature the solution in more detail in the next issue of Defence Helicopter. I have written before about the progress of the JMR/FVL effort, and do enjoy the rolling debate about the merits of the tiltrotor versus the co-axial compound. However, there does seem to be increasing scepticism whether the programme will come to fruition or be adopted by other countries beyond the US given the likely cost. In which case, affordable upgrades and life extensions will become even more of a hot topic. Sitting down to watch a James Bond movie you expect an expensively filmed mishmash of guns, gadgets and girls with just a wafer thin layer of plot spread over the top. Yet in the past couple of outings it has become increasingly difficult to concentrate on the nuanced character development and subtle plot twists, ahem, due to the number of helicopters gracing the screen. Skyfall effectively acted as a 143 minute advertisement for AgustaWestland (more on that later), while the latest in the franchise, Spectre, has two key sequences featuring rotorcraft, with a third thrown in for good measure. For anyone with more than a passing interest in aviation, trying to work out which particular variant of an aircraft is being thrown around the sky completely distracts from enjoying the implausible action scenes. The opening scene of Spectre, in particular, features a MBB Bo105, which initially seems like an odd choice for a shadowy international criminal syndicate, until you realise the aircraft is, of course, the helicopter of choice for Red Bull helicopter stunt pilot Chuck Aaron. The sequence is one big homage to what not to do in a helicopter – strangling the pilot and forcing the aircraft into a barrel roll being near the top of the list – and the question all over the internet was whether the stunt was performed live or was the result of digital trickery. Anyone who has seen footage of Aaron performing in the Bo105 will know it is quite possible. This is thanks to the type’s hinge-less, rigid articulating rotor and titanium rotor head combined with Aaron’s modifications to pimp up the aircraft further. Given the altitude of Mexico City, it is all the more impressive just how far Aaron was able to push the machine, at times flying just 30 feet over the thousands of extras. Spectre wraps up with Bond pursuing a SA365 N2 Dauphin down the Thames in London (reportedly the same helicopter that appeared in Jaguar’s ‘it’s good to be bad’ commercial). Without going into details of the implausibility of the sequence, as someone who commutes in London, the subtext for me was the disruption that must have been caused getting the footage in the can. Curiously, the official production notes for the movie says the helicopter involved in the climax was an AgustaWestland AW109. If so, it’s the first AW109 I’ve ever seen with a fenestron. I think there was an MD500E in there as well but was distracted by a really big explosion. Spectre’s love affair with the helicopter follows extensive rotorcraft sequences in Skyfall, which we featured in detail in the Feb-Mar 2013 issue of Rotorhub magazine. Once it was established that Bond would be attacked by his enemy’s armed helicopter while at his ancestral home in Scotland, director Sam Mendes wanted a rotorcraft that was not too “namby pamby”. Corbould’s team originally considered a Boeing Chinook, but ultimately opted for the AW101, which for the record was modified with a Spectrolab Nitesun search light, which was fully functional; a ‘sky shout’ speaker, which was not integrated; and a 0.5in-calibre machine gun in the side door provided by the UK MoD. Hiding the helicopter’s actual registration marking, the AW101 had a decal added – an orange circle with an upturned triangle at its centre. Funnily enough, AgustaWestland was not too keen for the actual aircraft to be destroyed in the crash at the end of the sequence so two third-scale AW101 miniatures, which were still 20ft long, were crashed into a third-scale model of the Skyfall house using a hydraulic arm. In one other dramatic moment in the film, Bond is saved by three AW159 Lynx Wildcats. While the aircraft in the film were computer-generated, the sound team was able to record three Wildcats flying in formation at the Farnborough Airshow to include the exact sound effect in the film. While we are geeking out on James Bond and helicopters – and in the interests of completeness – Spectre is not the only film in the series that is book-ended with scenes that involve helicopters. For Your Eyes Only in 1981 also features two central appearances of the helicopter, including what may have been the world’s first optionally-piloted aircraft, albeit remotely-controlled by a criminal mastermind.